I have the privilege of honestly saying that I've enjoyed a very full and fulfilling life thus far- plenty of rewarding experiences and varied opportunities -- all made so much better with the company of cherished friends. I've worked hard, played much, traveled far and tried to make the most of every minute to live life to the fullest.After IKE I landed at Whitworth College in Spokane which was just far away and close enough to home at the same time. College was a great experience for me and I'm still in contact with my classmates and professors after all these years. A liberal arts college expands the experience in many ways. While I thought I wanted to work with juvenile delinquents (save the kids) - I ended up in the niche of caring for older adults, with a specialty in Alzheimer's care. After college, I opened and ran an Adult Day Care Respite Ctr affiliated with a long term care facility in Seattle. Soon after, I became a discharge planner (aka Social Worker) for Stevens Hospital in Edmonds, WA. where I later became a registered counselor. I went on to get a certificate of Study in Aging from UW and became involved with the national Alzheimer’s Association volunteering in Seattle and Chicago and speaking at national conferences across the country. I was recruited by a National Health Care Company - Hillhaven in Tacoma, and worked there for 11 years in a variety of positions- Marketing Director, National Director of Specialty Program Development and Director of Clinical Operations where I had the opportunity to develop programs for Alzheimer’s, hospice, rehab, AIDs and general long term care. It was a great experience and a good ride that took me across the country to live in Louisville, KY. Yes, I've been to the Derby @ Churchill Downs, wore the fancy hat and played in the infield. You have to do it at least once if you live there! No one probably ever wakes up in Seattle and thinks "I'll move to KY..." but I did and it really was a great experience. Wonderful old houses, lots of culture and pleasant people. - I never did get a taste for bourbon - but supplied enough for plenty of visitors. I travelled 80% of the time which gave me a good view of the 38 states that I worked in. The Sat night stopovers gave the company a good discount and I got to reconnect with friends across the country. I came back to Seattle to work for ERA Care, at Ida Culver House Broadview and after 2 years was called back to Louisville to develop elder care programs for Atria Assisted Living, and also worked as an Administrator for a few years. Eventually I took a 6 month sabbatical from the constant travel to enjoy my friends, gardening, traveling for fun and taking classes at the local university. Exactly 6 months and 1 day later I started my own business - Elder Concerns & Care - providing consultation and education to long term care providers, architects and others on Alzheimer friendly programming and design. My first BIG contract lasted 2 years and I commuted to ID, WA, OR, MT and CO - from Louisville until I accepted a VP of operations position - and still commuted to the NW from Louisville. After way too much time on the road and away from home, I resigned and accepted a position with Lutheran Homes of SC- a non-profit organization that provides residential housing, health care and hospice for older adults. As VP of Planned Growth & Development I'm responsible for overseeing and supporting operations, marketing, culinary & hospitality services, wellness and all the other day to day stuff for 5 retirement communities, 3 hospice offices and 2 home care agencies. It's a perfect job as it is the sum of all best parts of all my other jobs rolled into one! I'm proud to say we are not your Grandma’s old folks home. It's upscale and active. Our wellness programs are renown in the business - residents are active they play Wii, practice the art of tai chi, Pilates, yoga, attend university classes, play with the symphony and then come back for a massage or a drink at the pub! Life is good for them! I've lived in SC for that past 5 years and thoroughly love living in this warm climate, full of music, art, design and culture. The only downfall is that it is clear across the continent…and my parents are still in Yakima, and my sister is in Vancouver-WA. Now, I can be home every night if I choose since I am not traveling down the highway for work. Columbia is the capital city and we're about 2 – 2.5 hours from anywhere else one might want to be- Charleston, SC; Savannah, GA and Raleigh or Asheville, NC. I live in a close knit and eclectic historic neighborhood, in a house that is on the historic register. We’re already planning a grand party in 2010 when "this old house" turns 100. I’ve been active with our Neighborhood Association that focuses on keeping the historic highlights intact and co-chairing a home and garden tour each spring. The warm and temperate climate here gives me a long growing season, and I have hundreds of pass-a-long plants from friend’s gardens and trips. I had the privilege of having my garden selected to be on the home tour. Once was enough- but it made me get everything on my “to do” list accomplished. My house has 850 sq ft of outdoor porches- which is a must in the south. We ate outside every month of the year for the past 3 years. It really is kind of Mayberry-ish here- we do hang out on our porches and talk- just enough to be informed but not nosey! And there is the other side of the fence where the real fun begins. Cooking and “concocting” for friends is my way of nurturing their hearts and feeding their souls, and a group of us cook & eat dinner together often. Now, I’m looking forward to a 2 week “foodie” trip to Seine, Italy in the Tuscan region with an Italian Chef and a few friends – imagine staying in a 13th century castle, wandering the saffron fields, hunting for truffles, olive oil and wine tastings, and cooking Italian feasts in a winery kitchen in the afternoons and then rustic style over open grill fires in the cooler evenings. Did I mention wine? It’s sure to be a trip of a lifetime- I’ll be in heaven! When I’m not in the garden or entertaining with friends, you’ll find me checking out the art scene here, there is so much culture - galleries, museums, films, and music. My dear friend is a composer and performer so I get to travel with him to some incredible events like the Food Network and the Paula Deen show- Paula’s Party – the black and white ball. He was the pianist and she lay across his piano and pulled $50 out her bra and tucked it in his shirt. It was great fun but the filming started at 730 am and lasted until 330 pm for a one hour show! Many re-shoots because of her risqué commentary. We wore formal attire, and it was fun to meet her back in the green room. She is, best said – “A hoot.” Then we got to be on Bobby Flay’s Throw Down Show vs. Paula Deen for Chicken Fried Steak. The day ended in a pouring rainstorm, with us running in tuxes, & long gowns with our shoes in hand through the puddles in the Savannah streets. Such is my brush with stardom & the Food Network. LOL. My family and friends come to SC often and I get back to the NW usually at least for Thanksgiving or Christmas. We usually meet in Vancouver, WA at Chris’s. I did come to Yakima for about 36 hrs on a NW excursion with a friend. It was fun to drive past IKE & around town. Some things never change and then there has been SO much change! I’ll not make the reunion as the date doesn’t work well with my work and other travel schedules. Deb Bernhardt found me on Facebook, which seems to be the easiest way to re-connect these days. I’m not that good at getting on the IKE 79 site. Deb did such a great job with the IKE website-we’re lucky to have someone so dedicated. It’s been fun to reminisce & reconnect. For those that attend the reunion I'll be there in spirit! If you're ever in SC- the guest suite is ready! Denise Dickinsen has a birthday today. 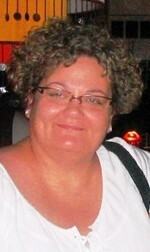 Denise Dickinsen updated profile. View. Denise Dickinsen posted a message on Kathleen Brusic's Profile. Southern humidity takes its toll & a girl gives in to her natural curls. Happy Halloween. You'de never recognize Miss Spider the next day on the street. I love this pix of my Dad and I last Thanksgiving in the dark of night on the beach in Neskowin OR. Glart (Glass Art) teeny tiny bits of glass built up in 6 layers and fused in a kiln. The assignment was 'landscapes' and this reminds me of WA hills in the spring.